You know you’re borderline when…. .……you take automated WordPress emails personally and feel criticized and upset by them…. Yes, at the risk of seeming to take BPD lightheartedly – sometimes you just have to laugh after you’ve cried – this was me, a few weeks ago. I was gutted and furious at the same time. F**k WordPress. How DARE it call me vain? Oh WordPress, how can you do this to me, and make me weep on the inside? I hadn’t even realised I’d clicked on a ‘Like‘ button – why are they so bloody impossible to find on other people’s sites when you’re looking for them, and so apparently easy to mistakenly click on, on your own? SORT IT, WORDPRESS! I was seriously upset. I was mortified at being called vain. WordPress was EVIL. It wasn’t until the next day that I actually understood the joke. 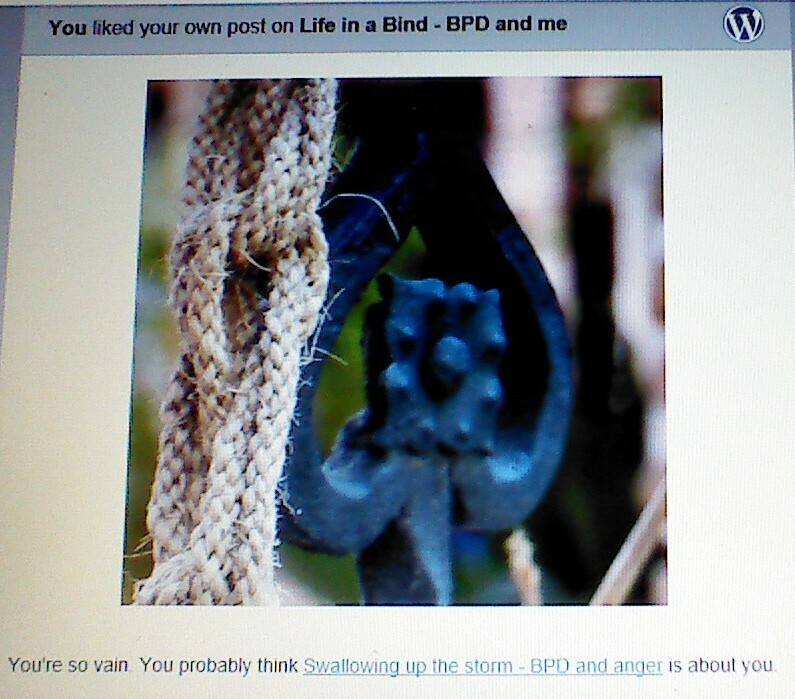 Of course I think ‘Swallowing up the storm – BPD and anger‘ is about me. It IS about me – it’s my post. Ha ha WordPress. You’ve actually got a sense of humour you mischievous son-of-a-b***h. You’re actually rather funny. But I’ll be damned if I ever ‘Like’ another post of mine again. Categories: Aspects of BPD, Poems, quotes and music, Sensitivity and invalidation | Tags: abandonment, anger, borderline personality disorder, BPD, BPD and being triggered, BPD and feeling criticized, humour, mental health, politically incorrect, wordpress, wordpress automated emails | Permalink. Often I find I am incapable of articulating my feelings: sometimes because of how vulnerable I am feeling inside and because of the reaction that that articulation might bring from others; sometimes because I have no idea what I’m feeling; and at other times because I have trouble distinguishing thoughts from feelings. 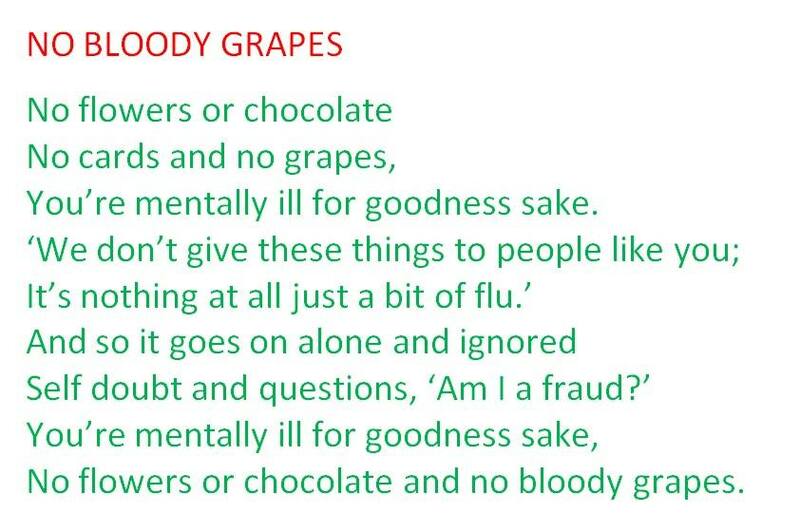 That’s where having a ‘feelings vocabulary’ can help – too often, it seems easier to describe a situation or my thoughts about a situation, than to look inside and identify how I feel about it. Having a set of ‘feelings words’ in front of me can help to direct my attention inward, and can help me to connect with my emotional state, rather than to intellectualise it. I find this post incredibly helpful because it both provides a ‘feelings vocabulary’, and reminds us that our feelings, in and of themselves, are neither right nor wrong. Our feelings simply ‘are’ – they are valid and legitimate, and being able to ‘own’ them is one of the biggest challenges that we can face. We can so easily get entrenched in the pattern of judging both our feelings and ourselves for having them (often because of messages that we were given in the past, either consciously or unconsciously, by others). Accepting our emotions, and allowing ourselves to feel them, can have immense healing power. I hope that being able to identify those emotions, and having a range of words with which to describe them will help me, and hopefully others as well, to take the first steps on the road towards that acceptance. Categories: Aspects of BPD, Reblogs, Sensitivity and invalidation | Tags: borderline personality disorder, BPD, communication, feelings, invalidation | Permalink.